In every pool, the player with the highest score for a round will wear the Yellow Cap until the next round, at which point he or she will hand it over to the player with the best score in that round (unless, of course, the original holder retains it by producing another pool-best performance). Everyone in the pool qualifies, every week... giving even those at the bottom of the leaderboard something to shoot for. As there are thousands of pools in every Superbru tournament, there are thousands of Yellow Caps: one per pool that floats from player to player. In the event of a score tie, our standard tie-breaking rules apply for the sport in question. If the tie cannot be broken, two or more players share the Yellow Cap. If you use more than one default pick in a round, you will not qualify for the Yellow Cap. Will you send me a Yellow Cap in the mail? Unfortunately not - the Yellow Cap is virtual only. In case you're wondering why, in order to supply a yellow cap to the winner of every round in every pool in every tournament, we would need to spend literally millions of dollars making and distributing caps. We wish we had that kind of money! 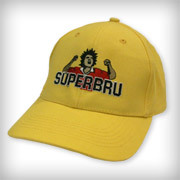 However, the good news is that you can buy a Yellow Cap from the BruStore. Yellow Caps are available in the BruStore and will ship anywhere in the world!